We have hit the ground running with our 2016-2017 school year. The kids and I have completed 15 school days and have 165 days to go. :) With this being our fifth year, I feel like I finally have a bit of wisdom and knowledge that I can pass on. 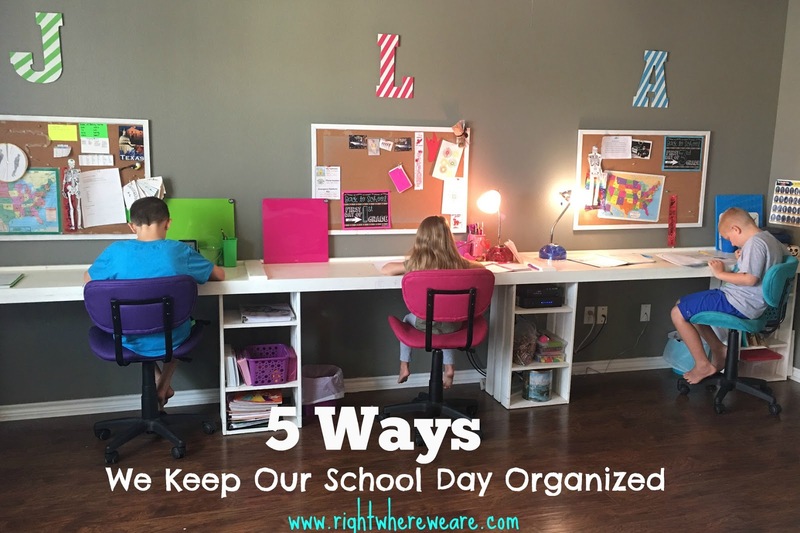 I have given it some thought and although there are many tips and tricks that I implement into our homeschooling day, there are 5 that stand out. I treat running our home school just as I would if I worked out of the house. It is not something we do on the side or when we feel like it. We have a yearly, weekly, daily schedule and I make sure we follow it. Now from time to time, something extra special will come up, such as an unplanned field trip. I try to be flexible in these moments but that is just it, they are moments, not every day. Our daily expectation is that we are in the classroom, kitchen, or outside working on our school work. I want my kids to follow my example of diligence and commitment to their education. If I treat our homeschooling as a priority so will my kids. This is where homeschoolers have very different views and ideas. I am a homeschooler that plans. It is what works best for me and frankly my kids thrive on a schedule and daily plan. I take about a month in the summer to plan the entire school year. 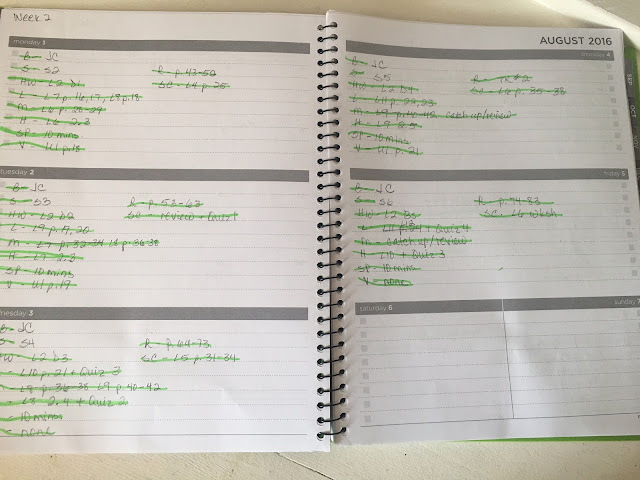 I know that some people do not prefer this method because they feel they will constantly have to erase and re-plan but for our family it works really well. There are times I have to move things around but they are minimal. During this time I also plan and schedule our grading periods and breaks. We start late July and go until mid May. For our family, it is very beneficial to work for 6 weeks (1 grading period), take a week off, then work another 6 weeks, take a week off, you get the idea. 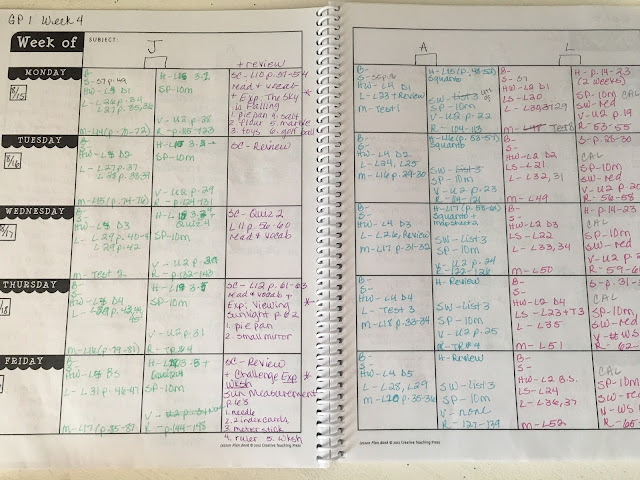 Over the course of a school year, we have 6 - 6 week grading periods with 6 - 1 week breaks, plus a week at Thanksgiving, Spring Break, and two weeks for Christmas. All in all we total 180 working school days. 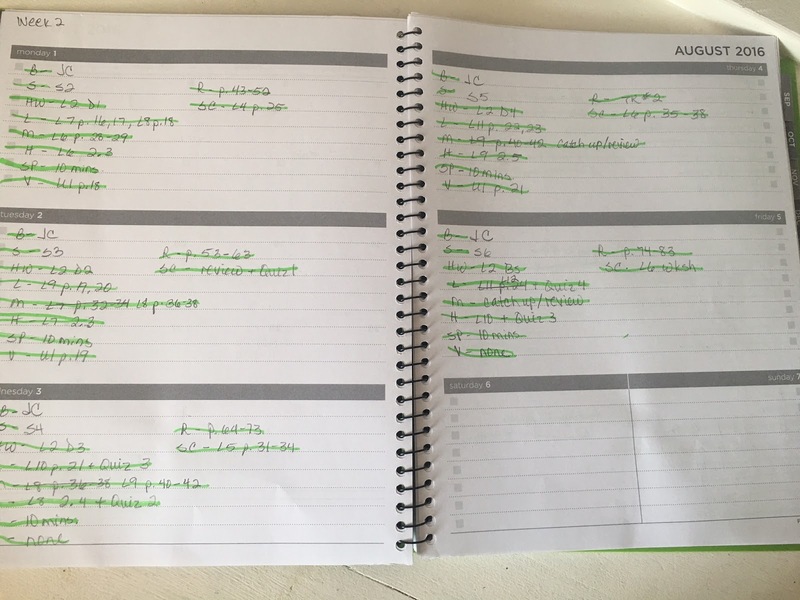 I know it seems like a lot to plan the year all at once, but I really can't imagine planning at the end of every single week. Just like the kids I also like having weekends! As stated above, I have the entire year planned before we begin. I keep all of our plans in my lesson plan book. I also write the daily plans in my kids' agendas. This gives them a list of subjects and lessons for each day. They know if I am working with one child and cannot be interrupted then they should reference their agenda in order to move forward with their day. This also keeps me from having 3 kids ask, "Mommmmmm, what am I suppose to do next." They know to always check their agenda before asking me. My kids would be the first to tell you the number one piece of organization in our classroom is the tower of work boxes. Each of the kids have six work boxes. Some boxes contain 2-3 subjects while other boxes only contain 1. It depends on the size of the books and extra supplies needed for each subject. Before the year starts I have the kids organize their boxes to make the most sense to them. I label and load each box. This keeps worksheets, books, folders, etc. organized and tidy. We also have boxes that hold school supplies, headphones for the computer, rulers, glue, craft items, scratch paper, paint, etc. In our family, even though we are not leaving the house for school, everyone gets up, gets dressed, and starts on time. This is a must for us. I think if I stayed in my pajamas and allowed the kids to do the same we would never get motivated to get our school work done. I wake up at 6 because I like the quiet time for getting showered, dressed, a cup of coffee, my Bible and prayer time, starting a load of laundry and 30 uninterrupted minutes of the Today Show. If you are wondering how I get my "me time" that is when I get it. It is worth it to me to get up early. Also, I will have all the "me time" I want in about 12 years and then I will be depressed because my house will be super clean and quiet. Well....I probably won't be depressed about the house being clean. :) The kids get up at 7:30, make their beds, get dressed, you know the drill. I try to have a home-cooked breakfast on the table by 8am. Some days it is a big breakfast buffet and other days it is called Cheerios. Either way, we all do better when we have had breakfast. My oldest son definitely performs better in the the classroom when he has had "real food" for breakfast. The kids are allowed one 30 minute show before we start school. They alternate days of the week for whose turn it is. During this time I say good bye to my husband, swap loads of laundry, and sneak upstairs to call my mom. I know, I know, I am 37 years old and I still prefer to start my day by calling my mom. :) We start school usually between 8:30 and 9:00. What is a "pluggable" you ask? In our house that would refer to anything that plugs into the wall. It is what our six year old says when I remind the kids zero electronics. This has been a rule since the very first day we started homeschooling. It has never been questioned by the kids. It also makes certain subjects like Spanish and Vocabulary Workshop extra fun because those are computer based. Sometimes we will play the radio but for the most part all three of my kids prefer a quiet atmosphere (except for the dogs who are never quiet). I roll my eyes at that one. Rescuing three dogs sounds like a good idea until a cat walks passed our house and all "you know what" breaks out in the form of barking. Back to pluggables, the kids know to wait until everyone is finished before turning on the TV or playing on the iPad. I think that is just teaching courtesy for those who are still working. Oh! That also goes for me. I try really hard not to get on Facebook, Instagram, or check emails during the school day. I also try hard not to take phone calls. I will usually ignore the phone all together and return calls when the school day is over. I have started leaving my phone downstairs with the ringer on silent. It really helps eliminates the temptation. I am pulled in so many directions throughout our school day, I honestly can't handle another distraction such as emails, FB, etc. The best thing about homeschooling is that you can tailor it to meet the needs of your family. For our family structure and firm plans work best. I LOVE getting a better understanding of how homeschooling works in your home! Great points. I don't home school, but I totally agree! Love, Love, Love your organization! Totally agree with you on #4. Even though I work from home I still get up, shower and get ready just like I would if I went into the office. Except I usually wear more casual, comfy clothes.